The Shield: On the shield, the conflict between invading Communist forces from the North and the UN offensive from the south, is symbolized by the interaction of red and light blue on the shield. Red also stands for courage and bloodshed; the gold denotes excellence and high ideals. The Marine Corps and United States Armyare represented by the swords, raised at the ready. 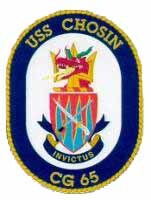 The rays symbolize the flame of combat and the frigid environment in the area of the Chosin Reservoir, from which the ship takes its name. The Crest: The crest's demi-dragon, breathing fire, represents the threat from China. 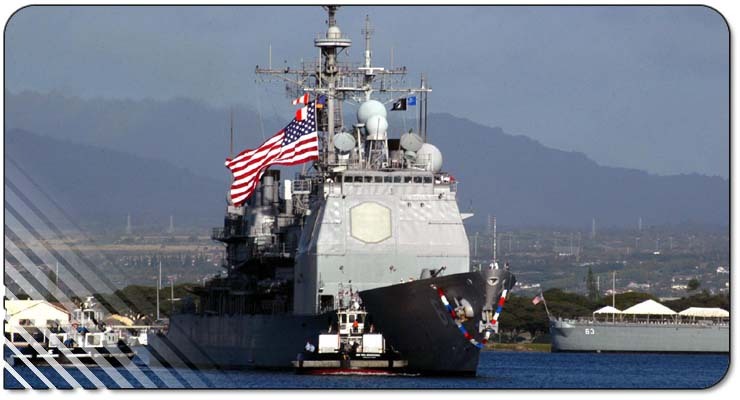 The demi-trident symbolizes Naval Power; gold represents excellence and courage in battle. Motto: The ship's motto is INVICTUS is Latin for "invincible" or "unconquered".